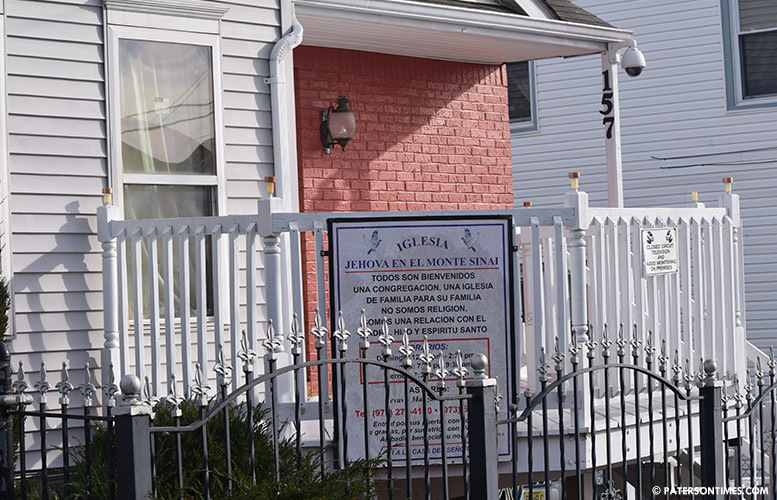 The attorney for the Paterson Board of Adjustment on Thursday evening told politically connected pastor Jesus Sevilla to cease operating a church and food pantry from a house on Atlantic Street. “How’s he operating? What authority does he have to operate?” asked Marco Laracca, attorney for the board. He asked Sevilla’s lawyer, Alan Mariconda, whether the church was active. Mariconda stated that it was. “He should not be operating quite frankly,” added Gary Paparozzi, planner for the board. Laracca said he will refer the case for enforcement to the Community Improvement Division. Sevilla was before the board seeking approval to legitimize the house at 157 Atlantic Street for use as a church. He needs to secure a certificate of occupancy and other permissions prior to using the house in a residential street as a church. His neighbors cited parking and noise issues to oppose having the church on their street. Karen Agosto, a resident of Atlantic Street, organized opposition against the “illegal” church. She and two dozen neighbors made known their objections to allowing the church on their residential street. This unexpected opposition to the application prompted Sevilla to seek a postponement. Mariconda requested to reschedule hearing on the application to January 25th, 2018. The neighbors opposed the rescheduling. “This individual has been there for a very long time. He had enough time,” said Agosto. A famously corrupt municipal government that raises taxes and cuts services did not catch the allegedly illegal church on Atlantic Street for years. The church has been there since 2009, according to the pastor. Neighbors also did not complain to the city. Some residents said at first the church was small and did not cause much of a problem. However, it has grown and the negative effects are being felt now, they said. Mariconda said his client is looking to modify the application and acquire additional off-site parking for the church. Fierro’s concern prompted Laracca to ask whether the church was in use. “My client has been in existence as a church there for many years,” said Mariconda. “Illegally” yelled Agosto from the audience. When he acquired the property, Sevilla was under the impression using the house as a church was a permitted use, according to his attorney. Mariconda said at one point the city granted the church a temporary certificate of occupancy that was later rescinded. The church was issued tickets for operating without a CO in 2016 that forced Sevilla to hire an architect and take other steps to operate legally as a church. Sevilla did not expect dozens of people to oppose his application. When he saw the large crowd, he had some of his church members, eight or so of them, attend the meeting to show support for the church. “Those people do not live on Atlantic Street,” said Alberto Garica, who has lived on the block for 40 years. He and other neighbors often find their driveway blocked by churchgoers. The testimony of those who do not reside on Atlantic Street may not carry much weight with the board. Sevilla on Thursday night would not say whether he intends to cease operating until securing approval from the city. In the past, he acknowledged operating without proper permits. “I know I did it wrong. I admit it. I made a mistake,” said Sevilla in a 2016 interview with the Paterson Times. Agosto alleged the pastor has been touting his political connections to intimidate residents from opposing the church. Sevilla has endorsed a number of candidates in the past. He endorsed councilmen Andre Sayegh and Luis Velez in 2016. Agosto and her neighbors said they plan to return in January to oppose his application once again. Many of the residents, who are opposed to the church, have lived on Atlantic Street for decades. Some told the board they did not receive notification about the hearing. Maria Rodriguez, lives two houses from the church, but did not receive a letter, she said. The applicant is required to send out notices to all properties within 200 feet. Laracca sifted through mail certifications that were submitted to the board as proof the notification letters were sent out. Rodriguez was not alone, a number of other neighbors also did not receive letters. Church?? Another Con-Artist! Only in PATERSON!!! What about the mosque on Bloomfield and Sussex? Was a church…Religious house of worship.